Nokia started shipping the Nokia N8 smartphone less than a week ago and as promised, the phone is available for consumers’ pleasure around the world. It has already begun deliveries to users in some countries who pre-ordered the device and in the process of taking orders in others. Now, for the first time, Nokia have struck a deal with Pakistan’s second biggest cell phone service providers Ufone to distribute the N8 in the country. Pakistan is one of South East Asia’s biggest and fastest growing mobile market where almost 60% (and counting) of the population owns a mobile phone. Rock bottom service charges and low priced mobile sets (mostly from Nokia) have put a cell phone in the hands of the common man in Pakistan and the market is growing on a monthly (even weekly) basis. Nokia sells the highest number of cell phones in Pakistan and all those are unlocked devices which make their way into the country without a deal with any of the service providers and users are free to buy a set of their own choosing and put in a sim of their favourite cell phone company at will. It was the RIM BlackBerry that was the first device to come officially to Pakistan through the biggest cell phone company Mobilink and then Ufone and Warid followed. The N8 will be the first smartphone from Nokia to come through a service provider and Ufone has pulled off a major feat in beating Mobilink to grab the deal. Nokia on the other hand seems to have realised the importance and potential of the Pakistani market where its phones are already massively popular and are trusted more than any other manufacturer’s devices. Ufone is currently promoting the N8 with TV commercials and online marketing through social media and their website is proudly showing the new smartphone which is now available to pre-order for their pre-paid customers. It is unclear when will it be available for the post-paid clientele. Ufone is inviting you to come and check out the N8 and its cool features at selected service centres before buying. Currently the device is available to order at Ufone’s main offices in Lahore, Karachi, Islamabad, Rawalpindi, Sialkot and Faisalabad. 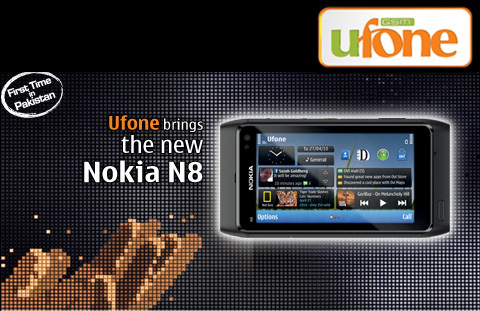 You can also pre-order the N8 through their website by visiting Ufone.com. Existing pre-paid customers can order the phone easily online by filling out their information on the pre-order page.